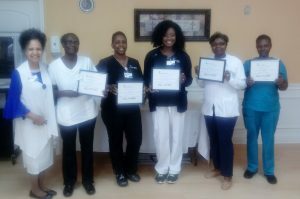 Congratulations to Signature HealthCARE of Palm Beach’s October iCARE graduating class! Our graduates were Claudia G., Gloria A., Epifanie G., Christa and Marie D. Our Chaplain Rev. Sonia was the instructor.